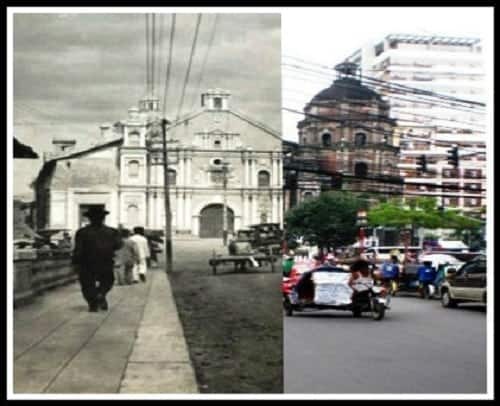 We can never turn back time but if it’s any consolation to us, there are vintage photos of Manila that we can still look at to relive the city’s glorious past. 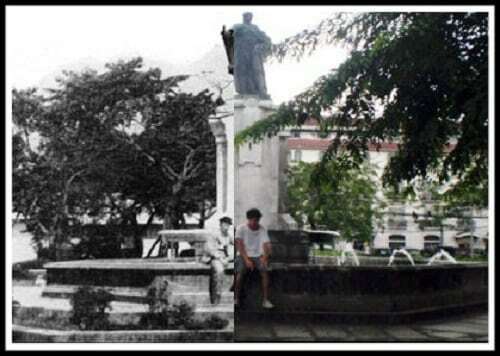 Most “then and now” photos, unfortunately, show how Manila has been ruined by pollution, modernization, and some Filipinos’ lack of appreciation to historical landmarks. Although change is the only constant thing in the world, it is imperative for everyone to look back, appreciate our history, and move forward with the lessons from the past instilled in our hearts. 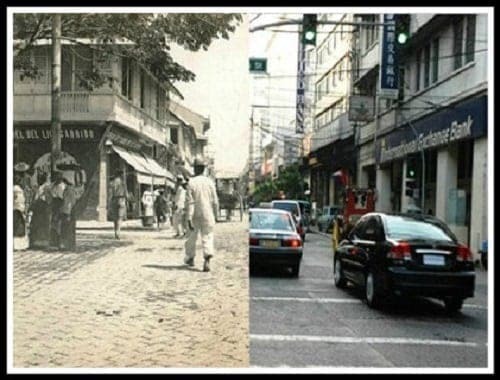 Below are 11 side-by-side comparisons showing how Manila has evolved throughout the decades. May this simple list remind us that we can still look forward to the future without forgetting our past. Courtesy of University of Wisconsin-Milwaukee Libararies. Plaza Moraga is where the famous street of Escolta is located. It was also the site of the first ice cream parlor in the Philippines, Clarke’s Ice Cream. This building in front of Sta Cruz Church housed the very first bank in the Philippines. Established by a Franciscan priest named Fr. Feliz Huertas, the Monte Piedad (“Mountain of Mercy”) Savings Bank served as a pawnshop for the people during its early days. 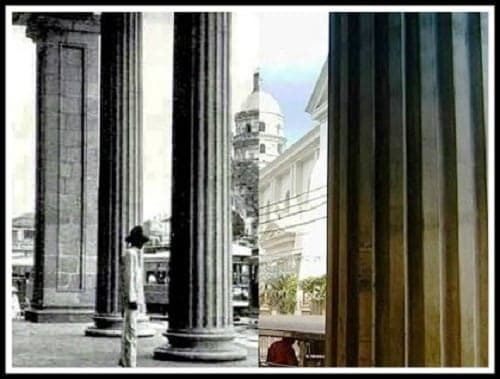 The bank was originally located inside the Intramuros but was later transferred in 1894 to Monte Piedad Building (now Prudential Bank Building) in Plaza Goiti (now Plaza Lacson). Located along Quezon Boulevard in Quiapo, Manila, the Life Theater was one of the top theaters in the city during the 1950s. The building was designed by National Artist Pablo Antonio and could accommodate a total of 800 people. 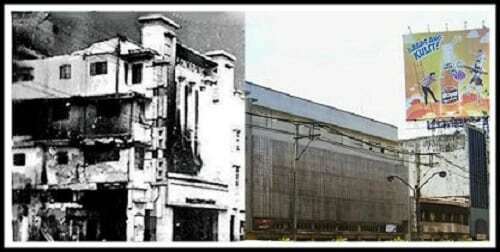 The theater eventually closed its operations, was renamed as the Villonco Building, and is now a shopping center. 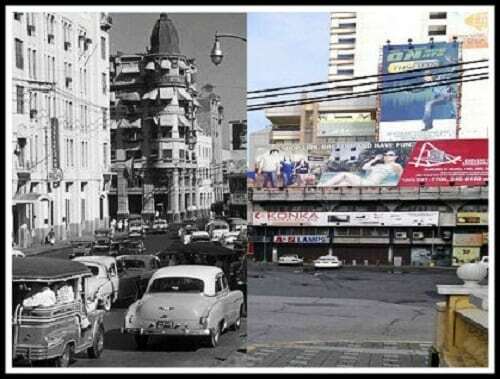 Quintin Paredes Street was formerly known as Calle Rosario after the district’s patron saint. 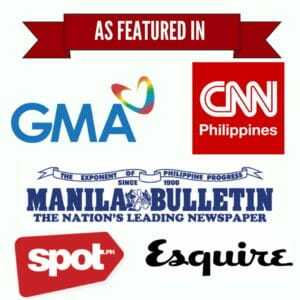 It was later renamed after a Filipino lawyer and statesman Quintin Paredes who became both a legislator for Abra and Speaker of the House. Also known as St. John the Baptist Parish, Quiapo Church is a Roman Catholic church that is home to the famous Black Nazarene. It was burned down in 1928 but was later rebuilt and painted cream. To accommodate a growing number of devotees, the church was expanded to its current form in 1984. 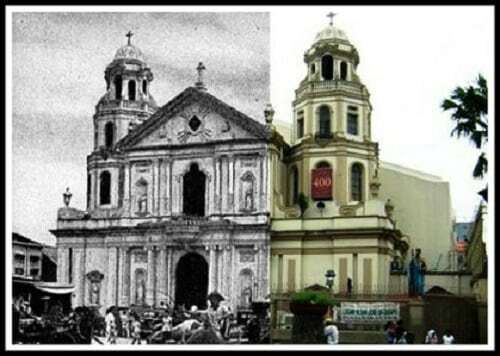 Also known as the Basilica Minore de San Sebastian, the San Sebastian Church is the only steel church in Asia. Built in 1891, it was declared a National Historical Landmark in 1973. Plaza de Roma is one of the two major public squares in Intramuros (the other one being Plaza de Armas). 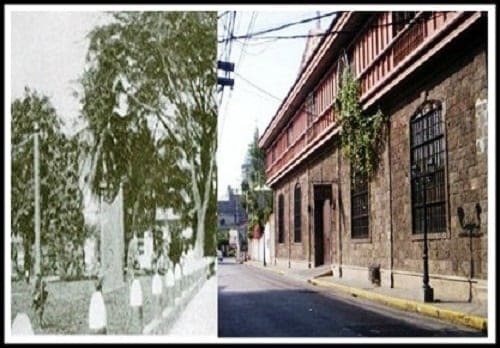 During the Spanish colonial era, it was considered the center of the city until it was converted into a garden in 1797 by then Governor-General Rafael Maria de Aguilar. The plaza earned its current name in 1961 when Rufino Santos became the first Filipino cardinal. It is surrounded by three important landmarks namely the Manila Cathedral (south), Ayuntamiento de Manila (east), and the Palacio del Gobernador (west). 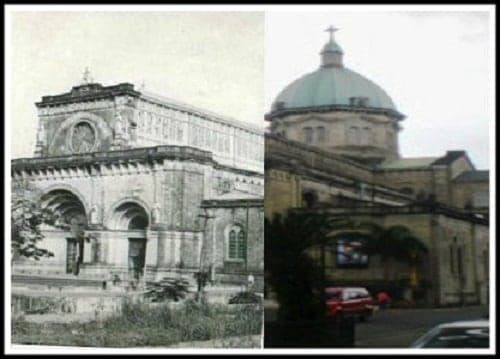 San Agustin Chruch in Intramuros is a Roman Catholic church that was one of the four Philippine churches designated by UNESCO as a World Heritage Site in 1993. The present-day structure is already the third church erected on the site. The first one was destroyed by fire in 1574 when the forces of Limahong attempted to invade Manila. 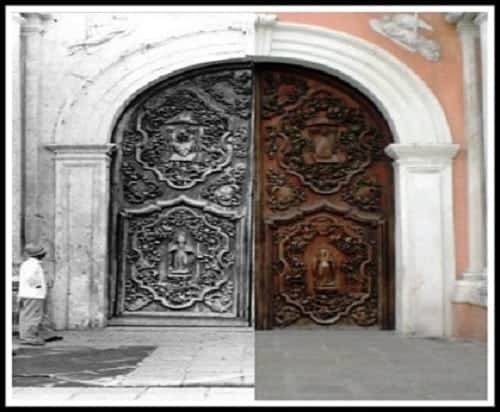 The second structure was also destroyed in 1583 after a fire accident which happened during the internment of Governor-General Gonzalo Ronquillo de Peñalosa. Founded in 1596 by Dominican priests, Binondo Church is also known as the Minor Basilica of St. Lorenzo Ruiz, after the country’s first official saint. The original building was destroyed in 1762 after the British forces bombarded the place. 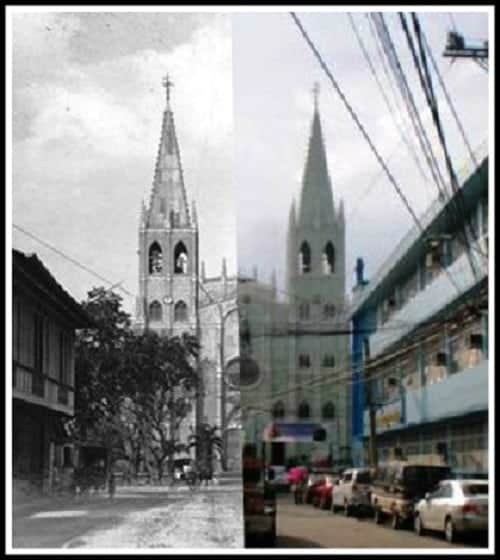 It was later replaced by a granite church in 1852 but the latter was also damaged during the WWII, leaving only the western facade and the octagonal bell tower intact. Originally owned by the diocese of Mexico, the Manila Metropolitan Cathedral-Basilica, or simply Manila Cathedral, was built to honor the Blessed Virgin Mary as Our Lady of the Immaculate Conception. The church, which serves as the highest seat of Archbishop in the country, has survived several earthquakes and damages since it was first established in 1581. Its present-day structure was completed in 1958 and was then consecrated as a minor basilica in 1981. General Luna Street, formerly known as the Calle Real del Palacio is the vistor’s pathway towards the major attractions that Intramuros has to offer, including the Manila Cathedral, Fort Santiago, Rizal Park, and San Agustin Church among others.